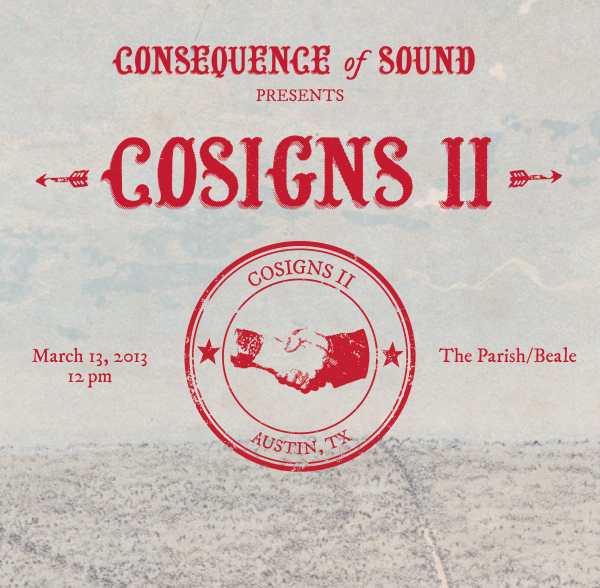 Last year, Consequence of Sound’s inaugural CoSigns proved to be one of the most talked about day parties during South by Southwest, with the jam-packed lineup of Cloud Nothings, Titus Andronicus, The Men, Screaming Females, and more. We plan to go even bigger in 2013. CoSigns II will kick off SXSW with a bang on Wednesday, March 13th at the The Parish Underground and Beale Street Tavern. Who’s playing? We’re not ready to reveal that just yet, but rest assured, we’ve once again booked some of the most buzzed about acts in music. In the meantime, RSVP to CoSigns II using the registration form below.